Protect yourself from unfashionable time traveling ninja warriors with these relatively easy to make leather shoulder pieces. Mine were made with the help of a laser cutter, but they could also be cut out by hand with a lot of patience, sharp scissors and an exacto knife. Lacing under the arm makes the size of the arm bands adjustable so they can be worn over outerwear as well as directly on the body. I am including a copy of the pattern I developed which you can simply download and use (or cut out in cardboard first and alter it to fit your design). If, however, you want to create a custom shape from scratch, I am also describing the steps I took to create my pattern. Developing this pattern takes a bit of time, but following the steps will also teach you a little about sculptural patternmaking, and help you design more awesome things in the future. -A piece of very stiff leather, usually cow hide, around 1/16 - 1/8" thick and at least 18x18” for one shoulder, or twice that for two shoulders. I used cow hide stamped with an alligator texture which ended up looking great. If you are using a laser cutter, you must use genuine leather, because the gasses released by a laser cutting pleather or vinyl (and most synthetics) are very unhealthy and can damage the laser. -A computer with a vector design program like Illustrator, Corel Draw or CAD. -Access to a laser cutter (if you don’t have access to your own laser cutter you can send your file to an online laser cutting service like: https://www.ponoko.com/ or http://www.customlasercutting.com/, or look up local laser cutter in your area). *I have not tried cutting this design out by hand, but I’m sure it can be done with the proper tools. -Access to a laser cutter, or the patience to cut the design out with scissors and an exacto knife. Cut a piece of pattern paper about 15”x15” and pin it onto the front of the dress form as shown, so it covers the shoulder and upper arm. Sketch the shape of the piece that wraps around the arm (the arm band), and the curved base piece that reaches from the arm up over the shoulder. Refer my arm piece, or your own sketch variation to get the shape right. (It’s ok if these lines are pretty rough, you will clean them up when you take it off the form). Fit around the underarm by slashing into the paper to free it so it can be pinned around the curve of the arm. Mark a straight vertical line in the two places where the front and back pieces of the arm band will meet: on the overarm and the underarm approximately half way between the front and back. Also mark the approximate over-shoulder line where the front and back piece will meet above the shoulder. True your pattern piece. This means removing the paper from the form, laying it on a flat surface, then using your ruler and hip curve to re-trace the lines you roughed in on the form, cleaning them up, making straight lines straight and curved lines more graceful. Add 1/2” seam allowance to outer arm and underarm seams and 1” seam allowance to the shoulder seam. Transfer your pattern by placing your paper over a piece of oaktag, securing it lightly with pins or tape and tracing over your lines with a tracing wheel. Remove the paper pattern from the oaktag. 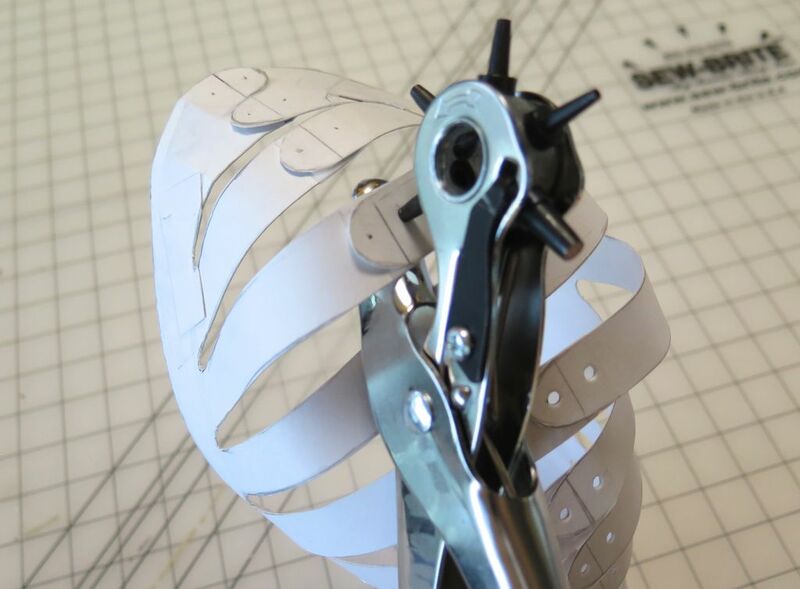 CutOut your oaktag patten piece with scissors by following the dotted outlines created by your tracing wheel. Now you have the front base of the shoulder armor pattern. Now you are going to repeat this process to create the corresponding back piece of the pattern. Pin your front base pattern piece onto the form. Align the overarm and underarm seams with their respective positions on the arm. Cut another 15”x15” piece of pattern paper and pin it to the back of the form with the front pattern piece still attached to the front of the form. Attach the two pieces over the shoulder by bending the front oaktag piece down slightly and pinning the paper over it. Sketch in the shape of the back base pattern piece, continuing the lines of the front piece the back, and being sure the new pattern piece lines up with the overarm and underarm seams of the front piece. The shoulder seam intersection can be pretty rough at this point as the shape will be refined later. Repeat the truing and transferring process from step 1 to complete your back piece. Pin your new back piece on the form, overlapping the front and back seam allowances on the overarm and underarm seams and taping or pinning it to the front pattern piece to create a complete armband. Now you are going to create the sculpted shape of your shoulder armor. Cut out a few long 3/4” strips of oaktag, divide these into 4-8" sections. Tape these strips to the base of the pattern, arching them over the shoulder from front to back to create the slats. Start with the bottom and top slats, trying to make their shape flow smoothly from the shoulder and arm, and then continue towards the center. A continuous piece from front to back to may work for the shape of some of the slats, but most will need to be made with two separate pieces joined at a slight angle in the middle to get the proper shape. Getting exactly the structure you want might take a little time and a lot of adjustments, so don’t be afraid to keep cutting and re-taping your pattern until you get it right. When you have something that looks good, take the piece off the form and try it on (or put it on whoever you're making it for)! The proportions will most likely look different on you than on a dress form, and you may want to alter it accordingly. Also you may want to adjust the size of the armband to fit your arm. Mark you overarm seam by placing your piece back on the form, looking at it from the side, and drawing a vertical line all the way up from the bottom of the armband to the top of the shoulder, bisecting each slat along the way. Try to make the line as straight as possible, but it doesn’t have to be perfect. Now take your piece off the form to finish your pattern. Cut along the overarm seam you have just drawn, dividing the the armband portion and each slat in half along this line, but leaving the underarm seam taped together. Trace the pattern by laying it flat on a piece of oaktag and drawing around it with a pencil. True the shape of the pattern by going in with your pencil, eraser and ruler and refining the shape of the slats, the armband, etc. If you want the places where your slats meet the base of your pattern to be ‘U’ shaped like mine are, trace that in as well. Mark 1/2” out from the end of each slat and add a curved tip to the ends. I chose to join my pieces at the overarm and shoulder with alternating overlapping tabs. It is easier and more accurate to pattern these in Illustrator, but you can also create them now. The best way to do this is to draw them in on one side of the seam and trace and copy them exactly to the other side, so they will fit perfectly when interlocked. In my final pattern I made five, 3/4” long tabs on the armband (from slightly larger at the bottom to slightly smaller at the top) and two, 1/2” long tabs on the shoulder. Cut your refined pattern out of the oaktag. (In the picture, I've cut mine in half at the underarm, but you don't actually want to do that yet). Tape your pattern back together, this time overlapping the curved ends of the slats. Match up the lines that marked the overarm seam to place the slats correctly. Mark a dot 1/4" on each side of the overarm seam line on each slat. Punch a hole through both layers at each of these dots. Separate the two sides by cutting away the tape that holds each slat together, and lay the pattern flat again. Now you can also cut the patten in half at the underarm. Scan your pattern pieces with a flatbed scanner, and import them into your chosen vector design program. I brought the files into Illustrator as templates and traced over them with the pen tool. I used the ellipse tool to create the 1/8” holes. Where the pattern had been cut at the underarm of the armband I shortened each side by 3/8”, and added 5 holes on each side for laces. This allows the size of the piece to be adjusted to fit different sized arms, or to fit over outerwear. I used the blend and reflect tools to make the tabs and holes on the armband and shoulder exact mirror images on each side of the seams. I also made sure to add extra space between these tabs, about 1/16" to allow for the thickness of the leather. If you do have a laser cutter, I recommend cutting out your pattern one more time in oaktag with the laser to make sure it all fits together properly. Also, the negative this creates comes in handy for placing the final pattern if you are using leather with a pattern or texture like I did. I lined up the pattern on my alligator stamped leather so the texture was mirrored on the front at back. (If you are using my pattern, make sure you turn off the visibility on the "Labels" layer before cutting). The leather will be sooty when it comes out of the laser. So you’ll need to wipe it down with a wet cloth on both sides and along the edges of the cut lines to remove as much of the soot as possible. It will also smell bad for a while, kind of like burnt hair, but the smell will fade eventually. Now you have your pieces cut, and you are ready to put them together! Take your cleaned piece to a steel table, cutting board or small metal riveting anvil. Start by riveting the tabs on the armband. Overlap them alternately and put in the rivets, inserting the long side of of the rivet from the back and fitting the short side on from the front. Tap them together gently but securely with a hammer. Once you have riveted the tabs on the armband, move on to the slats, continuing to alternate the overlap up through all the slats and the shoulder tab. Lastly, thread the leather lacing through the underarm holes from bottom to top and tie them in a knot on the inside so they can hide under the arm. Try on your piece and adjust the tightness of the lacing to fit just right over a sleeve or bare skin. Wear one for an asymmetrical look, or reverse the pattern to make a second piece for extra ninja protection. Great instructions, thank you so much. I found a laser cutter at a local hackspace that helped with the cutting, watch out for fumes if using fake leather. I also used fasteners from the stationary store instead of rivets (with masking tape over the inside to stop them cutting into skin). This meant I could undo my shoulder pieces and pack them flat in a suitcase and put together easily at the other end of flight. I'm upgrading the shoulder armor shortly and putting little LED lights inside, so they'll shine through at night. Nice. I haven't made it down to Tandy yet, but I've heard they have a really great selection. I'll have to check it out soon. Thanks for all the suggestions on other ways to cut the leather. It will still be a tricky process since there are a lot of tight curves in this pattern, but I'm sure the right tools will make a big difference. You could also re-style the pattern slightly to avoid the tight curves if you were cutting it out by hand. Doubt it - leather doesn't like abrasive cuts, like drills for new belt holes. Perhaps you need a better pair or scissors? Its also possible to freeze leather and cut/drill it but its not as good as proper leather shears. For the cheapskates (or if you're in a hurry and can't wait for your special-ordered leather shears), trauma shears will work fine too. You know, those crooked stubby scissors that EMT's use to cut clothing off accident victims? They look look flimsy, but they're designed to cut through jeans and belts. And you can find them for $5-10 in the first aid section of many supermarkets. I've found for cutting belt leather and thicker that tin snips work well too. Also if you're patient, just a couple passes with a razor will do just fine. By the way, most leathers are chrome-tanned, and will give off toxic fumes. They won't be quite as corrosive to the laser cutter as chlorine released from cutting synthetic leather, but still not something you want to inhale. Vegetable tanned leather is safer, health-wise, but may be hard to find if you want a leather with a cool stamped texture, like the alligator pattern used here. Yes, no matter what you need to make sure your laser cutter is very well ventilated, and I made sure to wait a minute before lifting the door of the laser to take out my piece when it was done to allow all the fumes to be sucked out by the ventilation system. Very cool design. Great work! These are so cool! I definitely want to make a pair!